A few months ago our project team obtained some fascinating results of GPS tagging showing the long journeys Yelkouan Shearwater females make before laying their egg. Yelkouan Shearwaters are early breeders in comparison to their larger relatives – Scopoli’s Shearwaters – that perform similar trips a few months later. LIFE+ Malta Seabird Project looked into the pre-laying period of Scopoli’s Shearwaters too. This was the first time such a study was carried out for this species in Malta, letting us peep into their open-sea lives far away from our islands. In fact, evolution has coordinated the breeding schedules of these two shearwater species to avoid competition for nesting sites and food. In some places in Malta, both shearwaters breed side by side. However the shift in their timetables is about three months. The little Yelkouan Shearwaters are already starting to hatch when Scopoli’s Shearwater romance is just coming to an end. After the courting period, the fertilised females are going on their pre-laying exodus far away from the nesting sites, and so do the males. Back at the cliffs the very demanding Yelkouan Shearwater babies get plenty of fish, as their parents do not have to compete for food with adult Scopoli’s. Similarly, later on, during Scopoli’s incubation period, only one of the parents is in search for food, while the other is sitting on the egg. Then, when their chicks will hatch, both the young and the old Yelkouan Shearwaters will be already out at sea. Whatever the timing, pre-laying exodus is a crucial period in the life cycles of tubenose families’ female birds. Having only one egg per breeding season, it is a rather big one and requires a lot of nutrients to build and energy from the female to lay it. To create the energy reserves needed, female Scopoli’s Shearwaters embark on a trip to the Mediterranean’s richest waters. 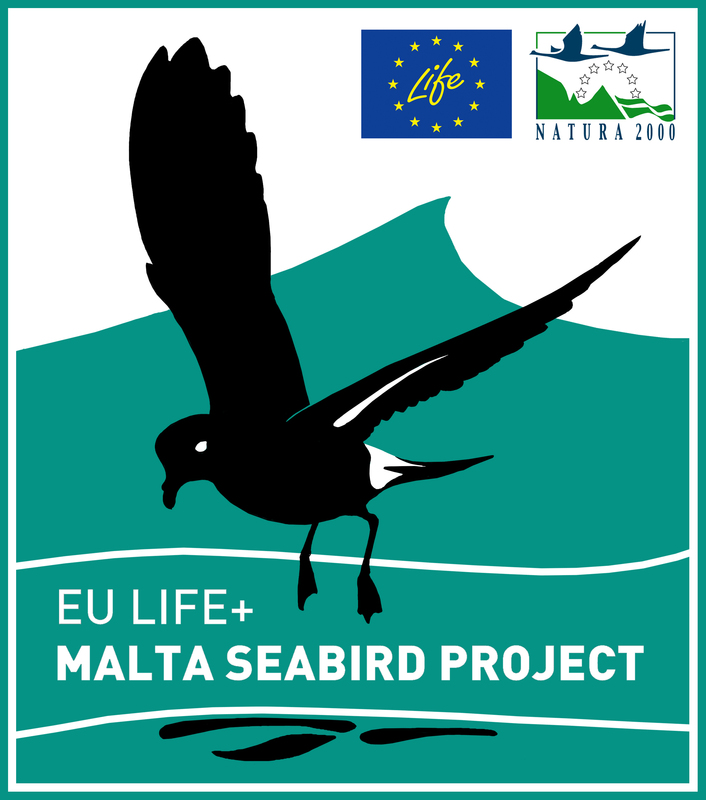 LIFE+ Malta Seabird Project team equipped 26 adult birds with small GPS devices, about 20g in weight. We chose established couples that were likely to breed again in one of the largest colonies in the south-west of Malta. Both males and females were fitted with these tags. Males also play a role during the egg forming period. First, they are preparing for the upcoming incubation duties, gaining some fat reserves for the long days in the nest. Second, they are known to come back to the nest regularly to make sure other males don’t occupy it. Meanwhile the females are away for 15-25 days. We found that both males and females feed mainly in the waters south of Malta, especially along the coast of Libya. But while the majority of females spent a long period at the coast of Libya, the males moved around much more. They made several separate trips to Libya as well as shorter trips closer to Malta and to the south of Sicily – a distance Scopoli’s Shearwaters can easily manage in one day. Although Malta cannot protect these areas away from their waters, knowing where Maltese shearwaters go during this very important period is still a step forward for their full protection. This data can be used by scientists and BirdLife partners in other countries to help them design their marine Important Bird Areas and seek legal protection. When the lengthy pre-laying trip ends, interestingly, the egg laying is highly synchronised within a few days, therefore the seabird team together with many volunteers had some very bird-intensive nights retrieving the GPS tags, containing useful data – we managed to retrieve 15 tags of 26. Watch the video to have a better insight of this process! ← Exodus – where do Maltese Yelkouans go before egg laying?